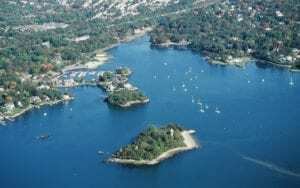 Whether you’re biking the East Coast Greenway in New England for a brief weekend trip or as part of the entire 3000-mile route from Maine to Florida or vice versa, this guide will help you plan your tour on the New England portion of the Greenway by highlighting lodging, campgrounds, eateries, bike repair shops, and points of interest along the way. 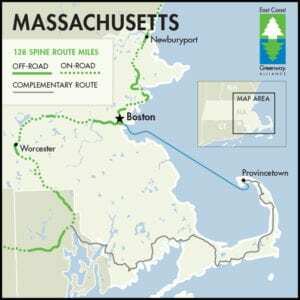 For someone interested in touring New England by bike, the East Coast Greenway is one of the essential routes to consider. 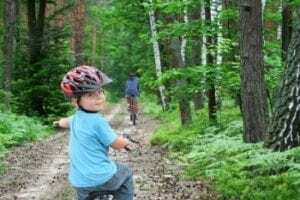 It’s a long-term project to connect existing and planned shared-use trails to provide a continuous, traffic-free route from Maine to Florida. 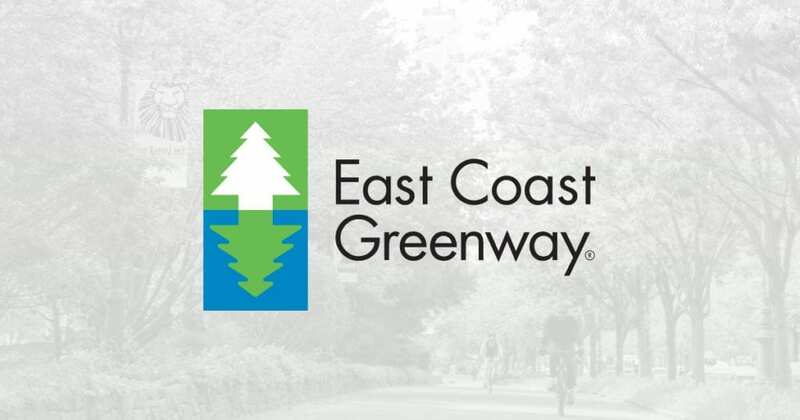 The project is run by the East Coast Greenway Alliance, founded in 1991 and committed to providing a paved corridor along the Atlantic seaboard for public recreation and economic growth. 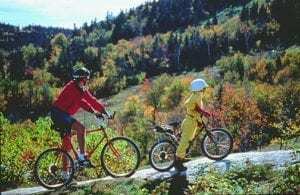 Within New England, the primary route runs about 800 miles from Calais, Maine to Byram, Connecticut, nearly 300 miles of which are already on off-road, shared-use trails, with new protected trails being added every year. For more information and to see which paved trails are already included in the Greenway, visit our East Coast Greenway page or go to greenway.org, the official website of the East Coast Greenway Alliance. We chose 19 cities at roughly 50-mile intervals along both the primary and complementary routes. To create your own route on the Greenway and print customized cuesheets, use the East Coast Greenway Alliance’s map tool. 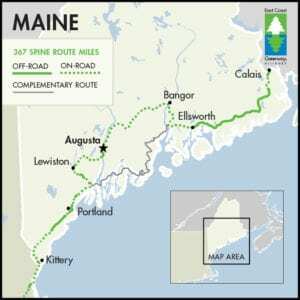 Calais, Maine is the northern terminus of the East Coast Greenway. There are a couple motels in town if you want a warm bed the night before you begin your tour. If you’re camping, the Keenes Lake Family Campground is a well-liked campground nearby. Karen’s Main Street Diner is the highest rated eatery in town, but there are a few other options as well. Unfortunately, there doesn’t seem to be a bike repair shop in the vicinity of the town, so you’ll want to be sure to have your bike tuned up before you get to Calais. Machias is the “Blueberry Capital of the World”: 95% of the world’s wild blueberry crop is harvested here. 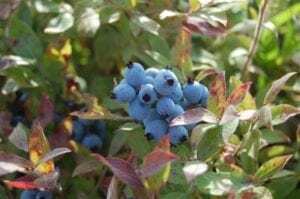 Plan your visit in August if you want to participate in their annual blueberry festival. The camping options in Machias seem to be a bit sparse, so you will want to choose between two highly ranked hotels: the Margaretta Inn and the Bluebird Motel. Machias has two nice local restaurants which are well-loved by locals and visitors alike: Helen’s, a seasonal restaurant, and The Blue Bird Ranch Restaurant, a year-round diner. Ellsworth is located just 10 miles north of Mount Desert Island (TripAdvisor), famous for being the location of both Acadia National Park (Maine Tourism) and Bar Harbor (Maine Tourism). The island is world-renowned for its incredible natural beauty, and it also has a wide variety of bike paths, so it’s a great place to stop and take a detour for a day or two. If you want to spend a night on the island, be sure to make reservations (far) in advance, if possible. A campsite on the island that we’ve enjoyed several times is Bass Harbor Campground. Back on the mainland, in Ellsworth, there is a broad selection of lodging options: you have the Ellsworth/Bar Harbor Hampton Inn for a chain hotel, the Twilite Motel for a local feel, and The Sanctuary B&B for the typical bed and breakfast experience. If you want to camp on the mainland, check out Patten Pond Camping Resort. Sylvia’s Cafe is a great American diner located in the town, while 86 offers a healthier though smaller menu. Cadillac Mountain Sports is an excellent bike repair shop with locations in both Ellsworth and Bar Harbor. Once the “Lumber Capital of the World” and currently home to horror novelist Stephen King (many scenes from his books were taken from actual sites in the city), Bangor is an interesting place with a lot of history. The Residence Inn by Marriott is a high-quality hotel located right on the East Coast Greenway, while the Bangor Quality Inn is a cheaper option. The Holden Family Campground is your best option for camping in the area–it’s the closest to the Greenway and has good ratings. 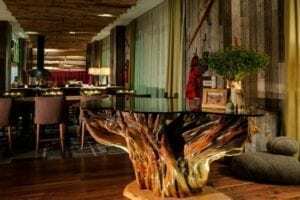 The three top-ranked restaurants at the time of writing are Timber Kitchen and Bar for a nicer dining experience, Friars’ Bakehouse for a great American menu, and Moe’s Original BBQ for… well, BBQ. If you need a tuneup or any repairs, stop in at Pat’s Bike Shop–it’s just off the Greenway as you make your approach to Bangor and is very well-respected. There are a handful of lodging options in Waterville. The Holiday Inn Express is your best choice for a good chain hotel, or if you want a B&B, go for The Pleasant Street Inn. Eat at Big G’s for good, standard American fare, or take a seat at Asian Cafe for highly-rated Asian cuisine. We couldn’t find any bicycle service shops close enough to consider recommending so you’ll want to make sure your bike is in good shape before you get here. 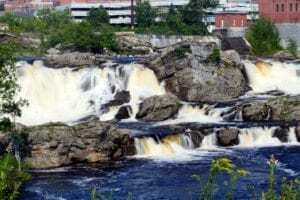 You may want to take a 1-mile detour to Simard-Mayne Memorial Park to see the spectacular Great Falls on the Androscoggin River. You can get pretty close to luxury accommodations with the Inn at the Agora. If you want a less expensive place to spend the night that still has great ratings, check out the Lewiston Hampton Inn. Both of them are conveniently located just off the Greenway. There aren’t any campgrounds near enough to recommend. Lewiston has a very diverse food scene. What’s more, many of the restaurants here are very highly-ranked. For fine French dining, go to Fuel Restaurant; for Indian, go to Mother India, for an American cafe, Forage Market; for a gastropub, Marche. These are all right along the Greenway route. For tuneups and repairs, you can’t do better than Rainbow Bike. It’s right on the Greenway and it has great ratings. If you’re passing through Brunswick in August, you may be interested in visiting neighboring Topsham for the Topsham Fair. The Daniel is the premier hotel in Brunswick. If you want a bed and breakfast, the Black Lantern B&B is the best around. Cedar Haven Family Campground is a really neat place to camp less than ten miles past Brunswick on the Greenway. If you’ve got a sweet tooth, you should stop at either the legendary Frosty’s Donut & Coffee Shop or the equally renowned Gelato Fiasco. If you just want a quick bite to eat, go for the Wild Oats Bakery & Cafe or Libby’s Market. All four of these are less than half a mile off the Greenway. For bike repairs, stop at Gorham Bike & Ski. 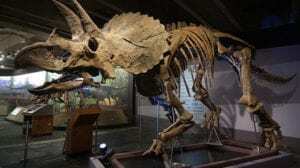 Portland is the largest urban area in the State of Maine, so, understandably, there is a lot to do and see. 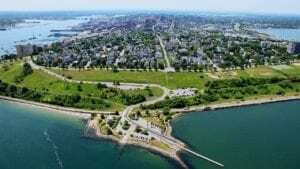 On your way through, you will bike the Eastern Promenade and enjoy expansive views of scenic Casco Bay. If you want to stay the night and you’re on a budget, you might want to check out Airbnb for a huge selection of affordable lodging options. However, two highly-rated chain hotels that lie right on the East Coast Greenway route are the Downtown Portland Waterfront Hilton Garden Inn and the Portland Downtown/Waterfront Courtyard. The food scene meets expectations in terms of variety and quality. The following choices are right on the Greenway. For fine seafood dining, go to Scales Restaurant; for the best pizza in Portland, visit the Flatbread Company; for ice cream, Captain Sam’s; for other sweets and a cafe, the Bam Bam Bakery. For bicycle service, stop at Cycle Mania as you enter Portland. They’re the closest bike shop to the Greenway. If you’re taking the complementary route down the coast instead of traveling inland, you’ll be splitting south at Bucksport and rejoining the main route in Brunswick. Rockland is the halfway point on the complementary route, so you’ll likely be making a stop here. 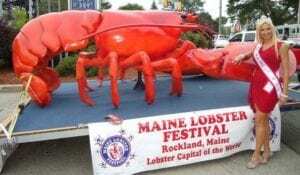 Rockland is home to the annual Maine Lobster Festival, which takes place at the beginning of August. For a lower cost hotel, check out the Rockland Harbor Hotel. For a nicer option, check out the 250 Main Hotel. For a B&B, look up the Old Granite Inn. These are all right on the Greenway. For camping on your way into Rockland, check out Megunticook Campground. For camping a little after Rockland, go to Saltwater Farm Campground. Good Mexican food can be found at Close to Home Subs & Burritos, and good coffee and baked goods can be found at Rock City Coffee Roasters, both right on your route. Side Country Sports is the best bike shop in Rockland. Portsmouth is a historic and picturesque maritime town, a great place to spend a rest day. The New Hampshire Seacoast Greenway is one of the few stretches of the East Coast Greenway that truly hugs the coastline, so be sure to have your camera ready. For lodging, Portsmouth Harbor Inn & Spa is located in Maine, right before you enter Portsmouth. 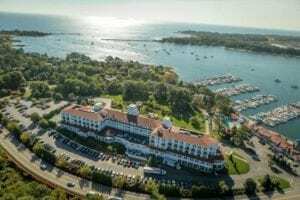 For two scenic options located in New Castle, a little past Portsmouth on the Greenway, check out the Great Island Inn or the world-renowned, historic Wentworth by the Sea. Portsmouth has many great restaurants. For fine dining on your way into town, stop at Mombo. For excellent seafood on your way out, go to Sanders Fish Market. For fine dining in New Castle, stop at the Salt Kitchen and Bar. There are many more options for both lodging and food in downtown Portsmouth if you’re willing to go a little out of your way. Pedal Power Cycle is your best option for bicycle service because it’s only a few miles off the Greenway and it has a good reputation. Cycling through Boston could be a great experience if you love the city, or it could be pretty awful if you’re a country gal. In time, we’d like to do a more thorough guide dedicated to recommendations and points of interest located on the Greenway outside the city. The choices of lodging and food are endless in Boston. You should do your own research based on budget and any plans you have for sight-seeing, but we’d definitely recommend checking out Airbnb and WarmShowers before you do anything else. Otherwise, you could start with HI Boston, a hostel with surprisingly high ratings which is probably the cheapest place to stay in the city. You can’t leave Boston without getting a meal in the world-renowned Italian North End. Salumeria Italiana is currently the #1 restaurant in the city. If you just want a quick bite to eat on the go, stop in at Theo’s Cozy Corner Restaurant instead. Also, if you have a sweet tooth you need to satisfy, the obligatory dessert in the North End is a cannoli. And not just any cannoli, but–speaking from experience–a cannoli from the legendary Mike’s Pastry. Back Bay Bicycles is a good place to get bicycle service. It’s not far off the Greenway route, which is the most important qualification when you’re in Boston, and it has pretty good ratings. Finally, the coolest place in the city, for all kinds of people, is the Boston Museum of Science. We’ve been there many times and it never ceases to amaze and fascinate. George Demake, Joanne Prizio and Dina Salerno of Regatta Deli. For lodging in Worcester, we’d recommend either the Worcester Homewood Suites by Hilton or the Worcester Downtown Holiday Inn Express, both of which are near the East Coast Greenway. If you want a bite to eat as you come into Worcester, stop at Regatta’s Deli for the best grinders in town (according to locals) and relax on the shores of Lake Quinsigamond. Bocado is the best place to go for fine dining–it’s right on the trail. And if you want food as you leave Worcester, stop at Miss Worcester Diner–a top 10 restaurant in the area. For tune-ups or repairs, go to Bikes and Life Bicycle Shop. They’re one of the closest to the Greenway and don’t require you to travel too far into the city. They also have excellent reviews. If you’ve taken the ferry from Boston to Cape Cod to bike the East Coast Greenway’s complementary route in Massachusetts, you’ll stop off the boat into Provincetown, a city filled with history and surrounded by natural beauty (the same could be said about Cape Cod as a whole). This is where the Pilgrims’ Mayflower landed in 1620–you will be able to see the Pilgrim Monument as you begin your ride down the Cape. 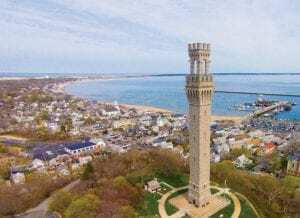 In recent decades, Provincetown has become one of the most popular tourist destinations in America for gays and lesbians. It is a highly seasonal town, so some of our recommendations may be closed in the off-season (i.e., any time before April/May or after September/October). This is another place where lodging fills up quickly and far in advance, so you’ll want to make reservations as early as possible. There are many, many inns and B&B’s in Provincetown. We’d recommend the White Porch Inn and the Somerset House Inn, both of which are rated at 5 stars at the time of writing. For a “best value” stay, check out the Atlantic Light Inn. There are several great options for camping on the “Outer Cape,” near or after Provincetown. Right near Provincetown, you’ll find the Dunes’ Edge Campground. In neighboring Truro, you’ll find the North of Highland Camping Area and Adventure Bound Cape Cod. The food scene in Provincetown is very expansive during the season, especially given how small the town is. The Lobster Pot is a mainstay: with over 2700 4- and 5-star reviews on TripAdvisor alone, this is a “must-eat” restaurant. For excellent cultural food, visit the Provincetown Portuguese Bakery. (Cape Cod has a large Portuguese minority population.) The best place for bike repair in Provincetown is Provincetown Bike Rentals. As you continue cycling down Cape Cod, you’ll be using the Cape Cod Rail Trail and other trails and roads until you reach Sandwich on the “Upper Cape.” Incorporated in 1639, Sandwich is one of the oldest towns in the country, and you’ll see evidence of that as you pass many protected historic houses, many of which have been repurposed as Bed & Breakfast’s. One of these is the Isaiah Jones Homestead Bed and Breakfast. The Dan’l Webster Inn & Spa will provide similar luxury accommodations (plus, it’s an incredible place for an upscale meal–speaking from experience), or you can stay the Earl of Sandwich Motel for another pleasurable but less expensive option. Shawme-Crowell State Forest has the only campground in Sandwich, and it is a rather nice venue (speaking from experience again, having camped there in the past). For some excellent and inexpensive pizza, order from the Sandwich Pizza Shop. For a nice cafe, try Beth’s Bakery; for standard American fare, go to The Brown Jug. There aren’t any bike repair shops in Sandwich, but you can stop at Corner Cycle Cape Cod in Osterville on your way there. 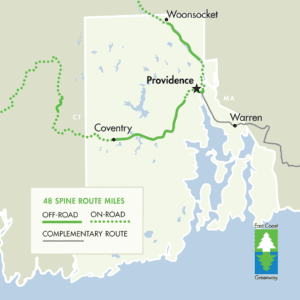 As you enter Rhode Island from the north, if you’re using the spine route of the East Coast Greenway, you’ll be traveling on the Blackstone River Greenway. After the complementary route rejoins the main route in Providence, you’ll be traveling on the East Bay Bike Path. For comfortable lodging, stay at the Providence Biltmore. For luxury lodging, stay at the Hotel Providence. There isn’t any camping in the immediate vicinity of Providence, as might be expected, but you might check out Ayoho Campground a little outside the city. Fine dining: Hemenway’s Seafood Grill and Oyster Bar. Sandwiches: Ocean State Sandwich Company. Pub: The Malted Barley Providence. All hotels and restaurants mentioned are located on the Greenway. DASH Bicycle Shop is the best place for bike purchases or repairs in Providence. Two points of interest on the East Bay Bike Path would be the Rhode Island Audubon Society’s Environmental Education Center and the Coggeshall Farm Museum, a working farm and living history museum depicting agrarian life during the late 1700s. Putnam is about midway between Providence and Hartford, but there’s not much here. You might want to use warmshowers.org or Airbnb to find lodging in Putnam, or there’s a Comfort Inn & Suites in Dayville leading up to Putnam. 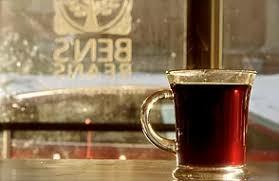 For food, Ben’s Beans is a great cafe, and Jessica Tuesday’s is a “Top Three” restaurant in the town. For bicycle service, go to Downtown Putnam Cyclery, a highly respected shop that also happens to be the only one around. On your way from Putnam, you’ll be traveling on the Air Line State Park Trail for about 10 miles, as well as the entirety of the Hop River State Park Trail. We’d recommend booking the Hartford Hampton Inn & Suites, or the Comfort Inn in East Hartford if you want to stay somewhere a little farther away from the city. There are so may places to eat in Hartford. You could start with Salute for fine dining or Angelina’s Pizza for cheaper eats. BiCi Co. is the closest bicycle shop to the Greenway in Hartford. On your way from Hartford, you’ll travel most of the Farmington Canal Heritage Trail. For lodging in New Haven, your best option is the Omni New Haven Hotel at Yale. If you want a less pricey place to stay a night, you’ll be best off working with Airbnb, or maybe WarmShowers. If you need to eat, go to Modern Apizza for the #1 restaurant in town. For a top ten choice that won’t cost you your bike seat, go to Louis’ Lunch. For fine dining, go to top-ranked Zinc. All of these are within a block of the East Coast Greenway route. The Devil’s Gear Bike Shop is a fantastic place to get a tune-up, and it’s right on the Greenway. 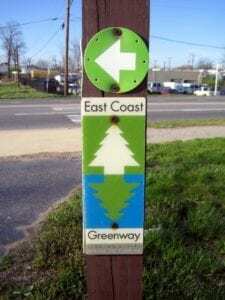 At the southern end of the New England portion of the East Coast Greenway, near the Connecticut-New York border, lies Greenwich, Connecticut. 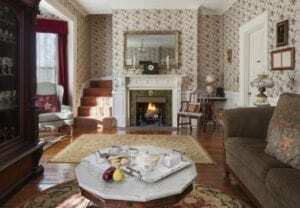 Unlesss you want to spend big bucks for high-end accommodations at the Delamar Greenwich Harbor Hotel–maybe as a well-deserved reward to mark the end (or beginning, or middle) of your tour–you’re better off using Airbnb or WarmShowers again. For food, Crew is a mid-range pub not far out of your way, and Express Pizza has a great menu as well. 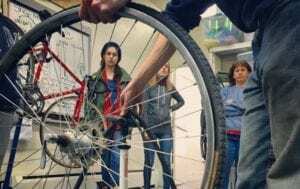 River Bicycles is the best place for bike repair in Greenwich–it’s the top-rated shop and it’s right on the Greenway.